Coastal Paper & Supply – Walter E. Nelson Co. 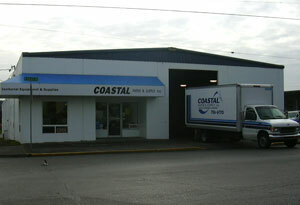 Located just two blocks west of Hwy 101 on McPherson Ave. in North Bend, Coastal Supply has been serving the Coos County business community for almost 4 decades. We offer a complete line of Janitorial Supplies, Cleaning Equipment, and Commercial Paper Products – all from the most respected suppliers in the nation dedicated to providing you the latest advancements in cleaning. Our experience comes from helping 100’s (actually closer to thousands) of local companies since we started in the 1970’s. From forest products, to the tourism industries – and every other business that makes the Southern Coast special – we value our long-term relationships with our customers. And our 12,000 sq. ft. warehouse is stocked “right”. That means that your products in-stock and available next day to your business via our Coastal Supply delivery fleet. A personal touch is what separates us from the competition. Visit our showroom and describe your toughest cleaning problems to our staff. We have seen it all, and we have the solutions.